I was watching mtv's cribs on the weekend and Tricia Helfer's home was featured. She breezed by a fantastic painting referring to it as her Rothko. After a little bit of internet research, i have a brand new addition to my list of fave artists. I love the way i react to Rothko's colours and their layers emotionally even though they don't necessarily evoke memories, deep thoughts or anything in particular. The don't require interpretation, they just evoke emotion. I wouldn't consider my attempt entirely successful. Partly because of suspect technique and also because of my struggles with colours. How is it possible to be affected by colours but unable recreate them? I suspect i need to be patient and apply many layers. And also try to avoid muddling them somewhere along the way. I started my painting on a sheet of Strathmore cold pressed 140 lb paper, running a Chinese mop brush all around the outside border wetting the paper about an inch wide all around the outside of the sheet. Then with another brush, undiluted pale cadmium red was added to the wet area, but only on the outside centimetre of the inch wide border. At this point the trouble with watercolour began. The edges of my sheet curled up and because my wet border was so wet, the water ran from the curled up edge to the middle of the sheet. Lesson: try to pre-wet the border evenly so water isn't pooling. Make sure the paper has soaked up the water. I also thought that using paper that is stretched would keep it from curling and buckling from being wet. So i started another version that i'd complete in parallel. The second version being done on the top sheet of a watercolor block of Arches 140 lb paper. Again the outside border of the paper was wetted about an inch wide. And again the pale cad red was added to the wetted border undiluted. This block of stretched paper didn't allow the wet paper to buckle and the paint didn't run outside of where i wanted it. I waited overnight for both sheets to dry. I used the same technique to apply the rectangles as was used for pale cad red border. I decided to make the yellow rectangle 1/3 of the sheet of paper, based solely on the rule of thirds, though i doubt Rothko ever used a principal so unnaturally. 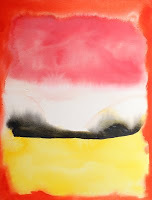 The paper was wetted and then lemon and cadmium yellow was mixed and applied to the wet rectangle undiluted. On the Rothko painting i was referencing, the pink rectangle looked like it was about half the sheet, but not quite. I didn't want to risk cutting the sheet in half, so decided to make the pink area 2/5 of the sheet instead of closer to half. The 2/5 area was wetted and then an undiluted mixture of Indian red and Chinese white was applied to the wet paper. This layer was very transparent and looked more brown than pink, so an undiluted mix of cad red and Chinese white was applied to that while the original layer was still wet. The black strip on both sheets was made in the same way. A wet line was drawn across the paper with a big brush and then a smaller brush added undiluted ivory black. The undiluted paint diffused into the wet area. When both sheets were dry, i re-did the pale cad red border on both paintings. I like both paintings, but not for the same reason i like Rothko's. So that's why i can't consider the exercise entirely successful. The runs and squiggles that resulted from loose watercolour technique are interesting and will probably beg the viewer to "interpret" them as if they were purposeful. They look like landscapes to me. I want the colours to be something more than they are here. Next time i'll go slower and apply multiple layers.